A transcript of an original hand written document. The Clan Cameron, Raising of the Regiment, Flanders, West Indies, Holland, -Ferrol and Cadiz, Egypt, Ireland, A 2nd battalion, Proposed abolition of the kilt, Denmark, Sweden, Portugal, Corunna, Spain, The Peninsular War, Busaco, Foz d’Arouce, Fuentes d'Onor, Death of Colonel Philip Cameron, Lord Wellington’s opinion of the 79th, Salamanca, Siege of Burgos, Vittoria, Pyrenees, Nivelle, Nive, Orthes, Toulouse, Home, Quatre Bras, Waterloo, France, Home, Chichester, Portsmouth, Jersey, Ireland, Canada, New Colours, Scotland, England, Gibraltar, "Bailie Nicol Jarvie", Canada, Scotland, Chobham, Portsmouth. War with Russia, New Colours, the 79th parts with some of its best men to the 93rd, ordered to the Crimea, the Highland Brigade, The Alma, Sebastopol, Balaklava, Valley of Death, Kertch, Yenikali, Sir Colin Campbell, Dr Mackenzie, Home, Madras, Allahabad, Lucknow, Boodaoon, End of the Indian Mutiny, Meeanmeer, Peshawur, Rawul Pindee, Earl of Mayo, Jubbulpoor, the 93rd Highlanders, Nagpoor, Kamptee, Bombay, Home, Isle of Wight, the Queen’s attentions and honours, Colonel Hodgson, Colonel Miller, Ashantee, Coomassie. 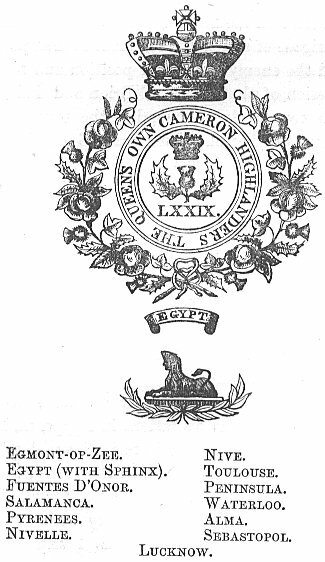 Aldershot, Edinburgh, Fort George, Glasgow, Sir John Douglas becomes Colonel, Gibraltar, Proposal to link the Regiment with the Black Watch made and abandoned, Depôt fixed at Inverness, Orders for Egypt, Alexandria, Ramleh, Ismailia, The Desert March, Tel-el-Kebir, Zagazig, Cairo, Sir Archibald Alison’s Farewell Order, Presentation of Medals by General Graham, Expedition up the Nile, Korosko, Wady Haifa, Kosheh and Mograkeh, Giniss, Honours from the Khedive, Return to England.